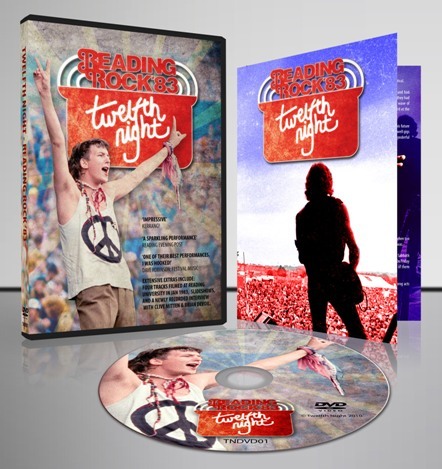 Our first self-produced Archive Release DVD released in April 2010, Reading Rock ’83 features our legendary performance with Geoff Mann at the 1983 Reading Festival. Filmed by festival-goer and Twelfth Night fan Colin Dodd, and recorded by the BBC – the soundtrack was first broadcast on the Friday Rock Show in October 1983. Although the footage is only from a single camera, if you have fond memories of seeing Geoff in 1983, then this tight 40 minute set consisting of The Ceiling Speaks, Creepshow, The Poet Sniffs a Flower and Sequences will take you right back. Or if you never saw him perform with the band, this thrilling performance will tell you all you need to know. David Read (who provided the excellent artwork for the Play On DVD) has lovingly and painstakingly re-mastered the video, synchronised it with the BBC stereo master tape, and enhanced it with some truly wonderful state-of-the-art animated stills. He has also designed the sleeve for us. There are lots of added extras. Besides some fascinating sleevenotes, you can expect four performances filmed at Reading University in January 1983 (We Are Sane, This City, Fact & Fiction, and Afghan Red), a new interview with myself and Clive, plus slideshows, MP3 audio and MP4 video files, and some other bonuses which you’ll need to buy the DVD to find! There is a short trailer for the DVD at our YouTube channel. “On 28th August 1983 Twelfth Night performed to their largest ever audience at the Reading Rock Festival. They had been gigging extensively throughout 1983, promoting their Fact and Fiction album, and had headlined the world-famous Marquee Club no less than eight times already that year. Before that they had appeared at the 1981 Reading Festival. By 1983 they had been lumped in as part of “the new wave of progressive rock”, and their contemporaries Pendragon, Solstice, Pallas and Marillion also appeared at the Reading Festival that year.